Why is there so much pain and suffering around love? Why does the dream of love so often become a nightmare? Not finding answers, so many women just finally give up hope of every finding authentic love. 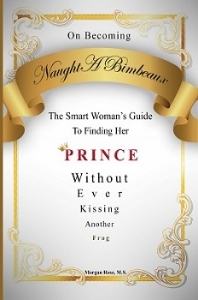 Relationship expert and author Morgan Rose has written On Becoming NaughtABimbeaux: to enlighten and empower the Single Sisterhood. She shows how to make sense of the nonsense of past relationships and, going forward, how to tell the difference between a man who can love and a man who can't...before he breaks your heart. When a woman shifts the question Will he like me? to Is he WORTHY of me? her life will never be the same. And shifting that question is exactly why Morgan wrote this book. "On Becoming NaughtABimbeaux" energizes your noble quest with a quantum leap from preschool to Ph.D. in learning what’s really in play when girl meets boy. The process requires a bit more than a new shade of lipstick, hiking one’s hemline, or cultivating a compulsion for NFL stats. After all, if you're with a man incapable of loving, it doesn’t matter what perfume you wear or how you turn him on. "This book offers a great balance of wit and wisdom. I appreciate how authentically the author describes the “bimbo” psyche –details that are almost never disclosed even to oneself, let alone to others. NaughtABimbeaux is a book I'm eager to recommend to clients and friends alike." Morgan Rose, Author of On Becoming NaughtABimbeaux invites you to her new website TheWorthyWoman.com.